The injury of a vulnerable child can make parents feel helpless and scared. When the harm results from another party’s negligence, feelings of anger and uncertainty further exacerbate an already stressful situation. Whether your child is injured by a defective toy or the negligent actions of a healthcare provider, there are legal avenues available to assist you with obtaining compensation from all responsible parties. At the Larson Law Firm P.C. our experienced North Dakota attorneys are well-versed in cases involving children’s injuries. We understand the unique challenges that come with caring for an injured child. That is why we work tirelessly to help families recover full and fair compensation for their physical, mental and financial damages. Our knowledgeable team provides the resources and advice you need to understand your options and make the best decisions for your case. If another driver is responsible for the car accident which injures your child, we can make a claim for compensation through the driver’s insurance company. If a defective seat belt or car seat is to blame, the manufacturer of those products could be held liable, as well. Every personal injury case is unique and requires a deep level of legal knowledge and experience to be successful, but cases involving children can be especially challenging. We conduct in-depth investigations into the cause of your child’s harm, work with doctors and local law enforcement (when applicable), and utilize state-of-the-art technologies to ensure that all responsible parties are held accountable for the harm they have caused your family. Child injury cases are some of the most personal and difficult matters that many families encounter. 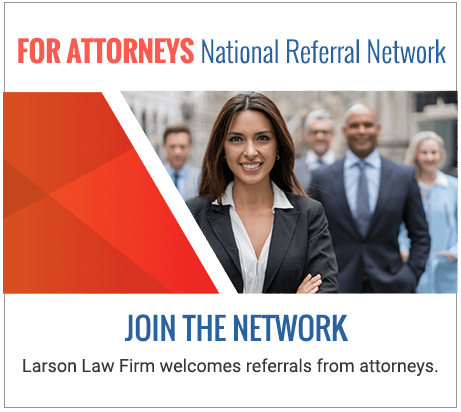 At the Larson Law Firm P.C., our compassionate North Dakota child injury attorneys understand how traumatic these experiences can be for your family. That is why we work hard to relieve the burdens you’re facing by resolving your case favorably and efficiently. To schedule a free initial consultation, call us at 701-484-HURT or complete our contact form. From our office location in Minot, we serve the people of Ward, Williams, McKenzie, Pierce and Mountrail Counties.